Harris Corporation (NYSE: HRS) successfully launched and communicated with their first small satellite from India’s Polar Satellite Launch Vehicle, showcasing the company’s ability to provide complete end-to-end mission solutions for the fast-growing smallsat market. 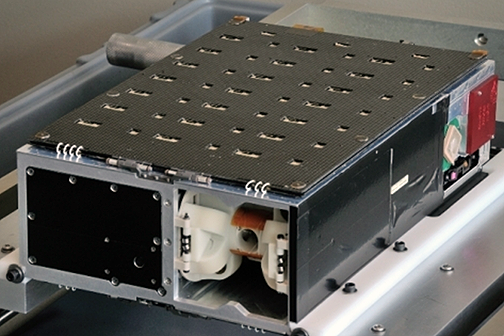 Harris Satellite (HSAT) is a briefcase-size 6U smallsat that provides an affordable solution for defense and commercial customers with high-speed satellite communications requirements. Designed to fly in LEO, the satellite features a persistent, resilient mission architecture that can be reconfigured after launch, reducing risk for customers. HSAT furthers the company’s 50-year legacy providing satellites with advanced, miniaturized technology capabilities. Harris will operate the smallsat from its satellite operations center and ground station in Palm Bay, Florida. Initial on orbit testing indicates HSAT is performing as expected. Harris has been awarded multiple smallsat pathfinder missions in advance of launching HSAT. The company is adapting technologies used in its high-performance sensors and payloads, satellite ground systems, and advanced data analytics capabilities for smallsat platforms to safely leverage NewSpace benefits for critical mission needs. Bill Gattle, president, Harris Space and Intelligence System, stated that HSAT’s successful launch and initial testing showcases the company's ability to design, build and operate a small, lightweight satellite that can be affordably launched as a ‘rideshare’ with other satellites on the same rocket. The satellite can then be reconfigured in space — enabling customers to upgrade or reprogram the application on orbit.